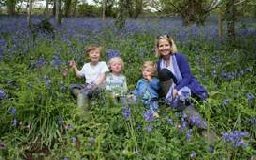 Bluebell Days at Hartland Abbey are legendary and a wonderful opportunity to visit at a reduced entry price when the valley is looking at its most beautiful. 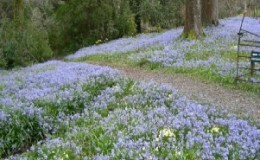 The bluebells at Hartland Abbey carpet the walks from the Walled Gardens to the sea. A restored woodland path links the Summerhouse to the Gazebo and Blackpool Mill overlooking the Atlantic. The restored Summerhouse was always a favourite spot for the family to picnic and for the children to play. If it is cold there will be a lovely log fire burning! See ‘Barton Cottage’ by the sea, the home of the Dashwood family in the BBC production of ‘Sense and Sensibility’and the location for BBC’s ‘The Night Manager’ by John Le Carre. 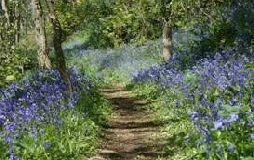 Along the way enjoy our bluebells, primroses, violets, wild anemones, wild orchids, foxgloves and much more. We love children and dogs and hope that you will bring as many as possible! There should be lots of lovely plants out in the gardens too; the early rhododendrons, camellias, tulips and later bulbs and early perennials amongst others. For the energetic, children and dogs, there will be plenty of opportunity for walking and exploring the 3½ miles of paths within the Abbey grounds. Bluebell Day entry prices: Adults £7, Children (age 5-15) £2, Under 5 free. Your entry ticket to the gardens and grounds includes the Museum, Exhibition and Gift Shop. Parking free. Entry to the house £4 extra. **NB We regret that loyalty and membership cards (eg HHA, CPRE, Gardeners World etc) are not able to be used on Special Event Days. The house will be open from 2 -5pm (last admission 4pm). The Old Kitchen Tea Rooms will be serving their delicious light lunches and home made cream teas.